I am trying to set up the remote control with my used ronin m and can not get it to work properly. Hi there, thank you for reaching out and we&apos;re sorry to hear about the trouble. With regards to that. 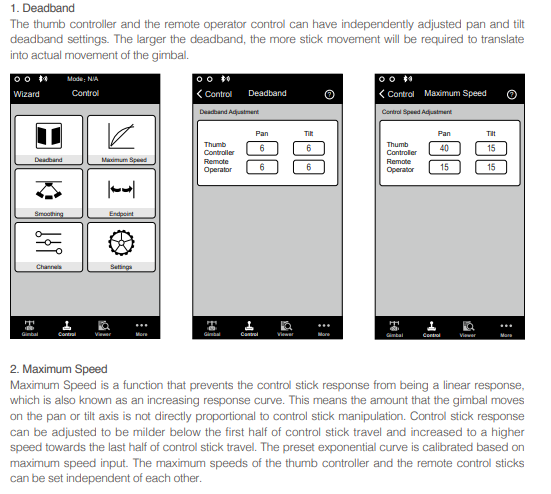 May I ask have you tried to adjust the setting of the Dead band and Maximum speed on the control setting? You can give a try to adjust it and see if will work. Thank you for your support. I have now tested several values (Even extrem ones like 100) for the deadband and maximum speed setting. The gimbal is indeed moving faster and slower so I assume the settings work just fine. However the problem is still present. I got a massive input lag and the gimbal moves in small increments. As if the signal get lost every second, working for one second and then gets lost again. I have tested these settings with the thumb controller aswell and it works just fine. With the thumb controller i do not get input lag and the gimbal moves perfectly. Maybe I got a faulty remote control? The previous owner of the gimbal told me that he never used the remote so it should be in brand new condition. 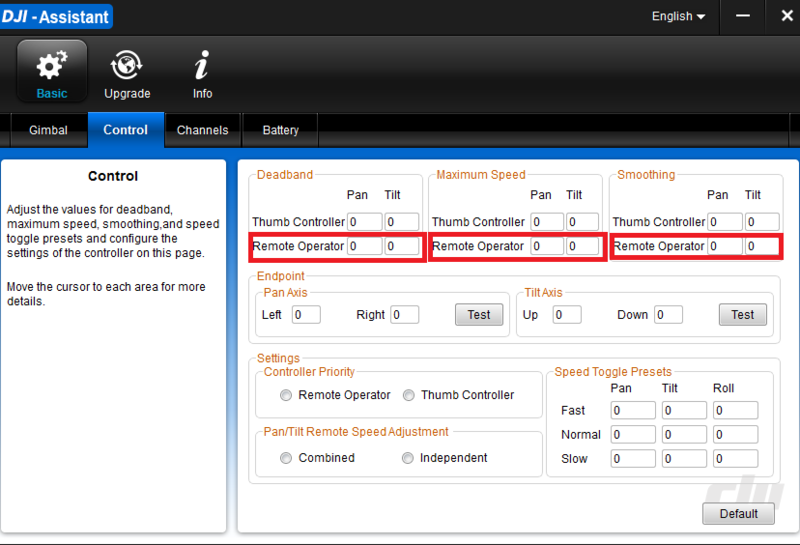 I&apos;m sorry to hear that, How about this have you already tried to change the setting of the Remote operator in Deadband. Maximum speed and smoothing? Please keep us posted. Thanks! Yes I tried adjusting all of those settings. I am currently using 8/8 for Deadband, 24/18 for Maximum Speed and 15/15 for Smoothing. Those settings work just fine even with the remote. However it does not fix my problem. 6. After a 2 second pause the gimbal starts moving again for about 15 degrees. I did more research and it turns out that the firmware versions I have installed do not match. They are basically incompatible. Since I bought my gimbal used, the previous owner updated the firmware before selling it. Can someone tell me the correct firmware versions that are confirmed to work? Without rendering my thumb controller useless which is working just fine with the current firmware installed. Ok so after a bit more research I found a solution for this! In order to do this you have to go to the windows for firmware update in the GimbalAssistant Software. The software will state that there is no update available. Just type in "door" on your keyboard. A new windows will appear. Enter "ronin" as Username AND password. Now the update should work just fine and install normally. My original problem is fixed. However I have no control over the roll axis anymore. Pan and tilt work just fine thought. If someone could tell me how to fix the roll issues, I would be very happy!